Have you tried growing Okra lately? This vegetable is coming into its own for a new generation of gardeners, thanks to improved varieties and rediscovered heirlooms with exceptional flavor and yields! If you’ve never thought of giving this humble sun- and heat-lover a try, reconsider the merits of easy-to-grow, quick-finishing okra! 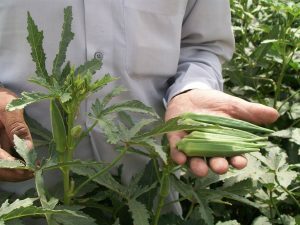 Many of today’s new okra varieties are spineless, which makes picking easier (no more poked fingers!). The flowers are almost as showy these days as the blooms, although some new cultivars get into the mix with colored pods. For a vegetable that looks modest when you see it picked and stripped in the supermarket, okra is pretty ornamental in the garden! And then there are heirlooms making a comeback, such as silver Queen with its blanched-looking creamy green pods and HUGE yields. Everything old is new again with this high-performing okra that redefines “plate appeal”! Growing okra is easy. The plants are very tolerant of clay soils and heat. If your summer growing season is short and spring is cool, start seeds indoors 4-6 weeks before planting out, at temperatures of 72-75 degrees. If the summer is growing season is long and spring is warm, start seeds outdoors after all danger of frost is past and the soil has warmed up. By late summer, when everything else in the garden is looking a bit drawn out, the okra will be happy and producing bunches of flowers and edible pods!